Pick a state to see current antler buyers in your area. This website is regularly updated to make sure all antler buyers are currently in business. Last update was on “2/21/2019”. 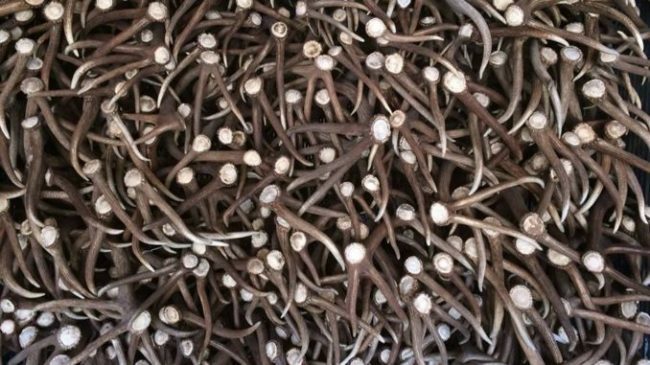 Each year dozens of antler buyers from all over the United States, Canada, and Mexico buy antler sheds. Antler sheds are used to make furniture, knifes, chandeliers, decor, and are also ground up and made into supplements and makeup. Korea and China are actually big importers of antlers. Hundreds of thousands of antlers are shipped from the US each year. How Do I Sell My Antlers? Antler buyers pay by the antler type, quality, and quantity. The better quality you have, the better the price you will get. If you want to sell your own antlers, then check out our antler buyer directory to find one near you. You may also search Craigslist and Facebook to find a buyer. Get a few prices before you sell your antlers (current antler prices). Buyers pay by the pound, or whether the antler is unique. Welcome to the #1 website to find antler buyers near you! I, Jon Waraas, created this website to help people wanting to sell their antlers easily find a antler buyer. I am a antler shed hunter myself, and have dealt with bad antler buyers in the past, so I created this website to help other antler sellers find reliable and trustworthy buyers. There are some bad antler buyers, but most are good. This website is set up to let people review antler buyers, in order to help other sellers pick a good and trustworthy buyer. If you have done business with an antler buyer on this site, please leave a review on their listing. I want to point out that no antler buyer is favored over another on this website. I am a un-bias 3rd party and do not allow any type of “sponsored” ads on this website. I randomly call, text, email, or Facebook message buyers on this site to make sure they are still in business. Every few months I also talk to a few random buyers to get the current antler prices, which you can see here. You may also use the form below to be emailed the current antler prices. ^^ Above: Here is a photo of a stack of Grade A elk antlers. Photo courtesy from High Country Antler Buyers.